If you call now, we can start working to get money you’re owed from Advanced Marketing and Distribution immediately. One phone call could get you on the way towards collecting payment on your unpaid Global Distribution Worldwide LLC bills. 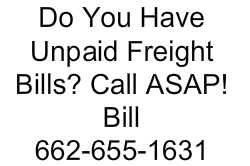 If you’re looking for help receiving payment from McGyver Heavy Haulers, make a point to call today! This company from the Houston area was responsible for brokering deals between trucking companies and shippers. This Ohio based broker performed as the middleman for deals between shippers and trucking companies. Did you conduct business with this broker based out of Florence, SC? Did you do business with this broker?